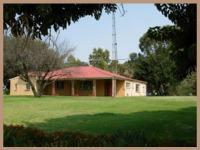 Baskop House is a large farmhouse accommodation situated next to the Vaal River. The property is eco-friendly, offers running water and comfortable shower and bed facilities that cater to hikers on the Vredefort hiking trails. It also offers a braai area for an evening's barbecue and can host up to 16 guests. The accommodation must be booked in advance. Hikers who head to and from Baskop can enjoy beautiful views of the Vaal River Valley as well as remnants from the Boer War and the gold mining days of the Dome. Swimming is also possible at various accessible spots along the river.